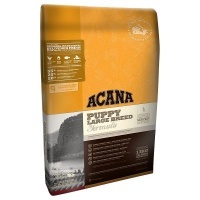 Biologically appropriate complete food for large breed puppies, with fresh free-range chicken and turkey, nest-laid eggs and wild-caught fish. Rich in protein and calorie-limited to promote healthy weight and reduce stress on joints. 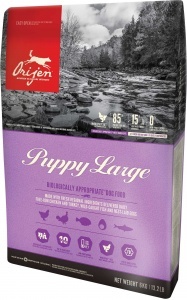 With 38% richly nourishing protein and a limited 20% low-glycemic carbohydrates, Orijen nourishes large breed puppies according to their evolutionary and biological needs. 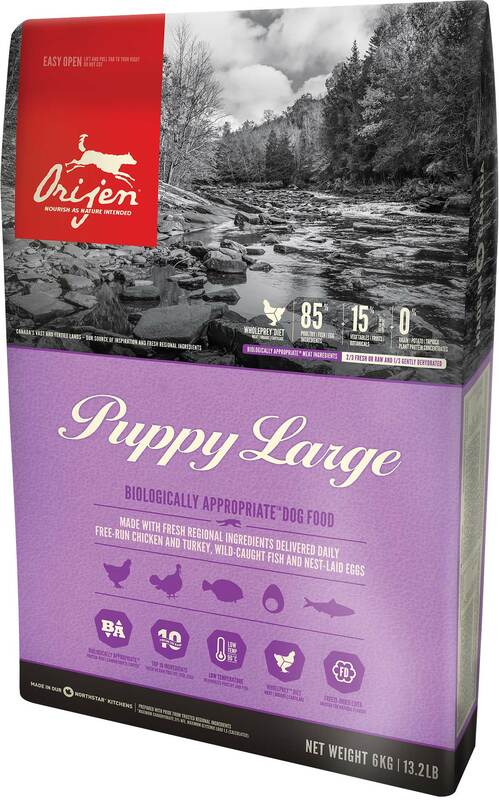 Nutrient-dense WholePrey ratios of fresh meats, organs, and cartilage plus fresh whole fish and fresh whole eggs provide a natural source of virtually every nutrient your big puppy needs. Crude protein (min. ): 38%; Fat content (min.) 16%; Crude ash (max.) 7%; Crude fibers (max.) 6%; Moisture (max.) 12%; Calcium (min.) 1.3%; Phosphorus (min.) 1.1%; Omega-6 fatty acids (min.) 2.8%; Omega-3 fatty acids (min.) 0.9%; DHA (min.) 0.3%; EPA (min.) 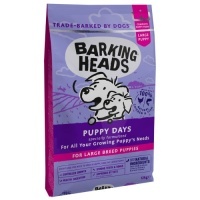 0.2%; Glucosamine (min.) 1400mg/kg; Chondroitin sulfate (min.) 1200 mg/kg.